SharnyandJulius™ are an Australian husband and wife team who teach fitness & nutrition. They describe this book as a “collection of parables for athletes”. But really, they also say that an “athlete” is anyone “who is doing something physical with a goal in mind” (p.107). This book talks about guilt, food addiction, intensity, play, mobility, excuses, failure, athleticism and laziness. The chapters are short — only a few pages each — but they pack a punch. I think my favorite chapter was “You, Athlete“. It talked about “default plays”, and about how you can change those. The only thing I did not like about this book was the chapter where Julius wrote about his food addiction, as he started off with a story about a friend of Sharny’s that had come to visit, and he went into far too much detail about his bodily functions. He also swore a lot in that chapter, and I thought that was unnecessary. This is the only chapter in the whole book that was like that. Overall, though, I really liked this book, as it takes aim at so many of our excuses. And, it’s readily readable. Recommended. I have been a big fan & promoter of this method since I first heard about it in 2005. Using its principles, I lost twenty-five pounds in six months while eating my favorite things (chocolate, ice cream, cheeseburgers, pizza, etc). In this latest edition of the book, the authors have removed many of the numbers that were in the previous edition (stats, weights, heights) because they believe that it leads to self-sabotage when these are the focus. They have also added two new chapters — one that gives scientific backing to prove that IE works, and the other that focuses on how to help children and teens become Intuitive Eaters. The chapter on kids was actually very interesting to me, as I have two of my own (ages 11 & 14), one of which is very rebellious in regards to food — he loves chips & ice cream, and it worries me that he’s learning all of my own bad habits. The authors insist, though, that letting kids make their own decisions regarding food (how much, what kinds, etc) is the best method because they will intuitively get in the balanced nutrition they need, if they’re left alone. It’s when an issue is made of their eating habits or their weight that they start to rebel, and/or lose faith in their ability to trust their internal cues. One thing that surprised me about this new edition was the constant reminder of how it’s important to put weight loss on the back burner in the beginning of this process. The reason for this is that, if you’re focused on losing weight — as opposed to just learning how to become an Intuitive Eater — you will sabotage yourself by either getting depressed over the slowness of your weight loss progress, or by seeking out other diets in hopes of quicker results. Lastly, there is a chapter on eating disorders, too, and how those caught in the throes of one can seek help, and also learn to eat intuitively. Overall, I most highly recommend this book, and this method. It is very much based on common sense, and we all know that dieting doesn’t work in the long run, anyway. This method is great because you can still eat what you love, you can eat out at restaurants without worrying about blowing your ‘diet’, and you can lose the craziness of obsessing over what food is “good/bad”. About the book: Just because a woman finally fits into her skinny jeans doesn’t mean she’s won her battle with food. Too often, women overlook the spiritual component to their physical struggle with healthy eating.Made to Crave taps into the desires God gave you to consume food without letting food consume you! Made to Crave is the missing link between a woman’s desire to be healthy and the spiritual empowerment necessary to make that happen. The reality is we were made to crave. Craving isn’t a bad thing. But we must realize God created us to crave more of him. Many of us have misplaced that craving by overindulging in physical pleasures instead of lasting spiritual satisfaction. If you are struggling with unhealthy eating habits, you can break the “I’ll start again Monday” cycle, and start feeling good about yourself today. Learn to stop beating yourself up over the numbers on the scale. Discover that your weight loss struggle isn’t a curse but rather a blessing in the making, and replace justifications that lead to diet failure with empowering go-to scripts that lead to victory. You can reach your healthy weight goal – and grow closer to God in the process. This is not a how-to book. This is not the latest and greatest dieting plan. This book is the necessary companion for you to use alongside whatever healthy lifestyle plan you choose. This is a fantastic book that can be used in conjunction with whatever diet/healthy eating plan you choose. But, be forewarned: if you don’t like the Christian viewpoint, you probably won’t like this book. Lysa starts off by reminding the reader that we were made to crave… but those cravings should be directed at God, and nothing else. She goes on to tell us her story, and to encourage us by giving us tools to use to combat our cravings, all the while reminding us that we were made for more ~ more than being stuck in this rut, more than frustration… We were made for victory! A lot of the book focuses on discipline and self-control. And, on how those things will lead us down a path in pursuit of holiness. We’re reminded that we cannot do this on our own, and that in order to succeed, we need to rely on God’s strength and not our own. My favorite chapter had to be the one on exercise (if you can believe it!). Mind you, I think it’s because it’s the one chapter that focused the most on discipline & self-control, and I’ve known for a while now that these are areas where I’m lacking. I loved the quote on page 89 (still in the same chapter) where it said, “Each pound lost was not a quest to get skinny, but evidence of obedience to God.” And, the chapter also talked about divided loyalties, and how we can’t be loyal to God when we’re being loyal to our cravings. I found myself relating to so much of what Lysa wrote about her struggles with losing weight. While she didn’t have a lot to lose, she still struggled with whether or not to make the same rationalizations and compromises that I, myself, struggle with on a regular basis. But, through God’s strength, Lysa learned to overcome her struggles, and to have victory over this battle — so I feel encouraged that I, too, will have victory in this area of life. Overall, this is a great book. It’s not preachy, and Lysa’s writing style is very down-to-earth and “girlfriend-to-girlfriend”… she’s hilarious, but also very wise. I highly recommend this one! If you want to maximize your experience and bring these teachings to life in a way you’ll never forget, you’ll want to order the full set of resources. Adding the DVD teaching series and the workbook will motivate you to get healthy without feeling deprived, lose the weight in a permanent way, and find the peace your body, mind and soul desires. This DVD study can be done in a group or by yourself. The DVD for this book is a great one. Each week you study something related to the topic from the main book, MADE TO CRAVE. The DVD sessions help you to go deeper, and help to further cement the information being taught into your mind. I really am enjoying this whole set/study! TO VIEW THE REST OF THE BLOG TOUR, PLEASE CLICK HERE. About Lysa: Lysa TerKeurst is an author and speaker who helps everyday women live an adventure of faith through following Jesus Christ. 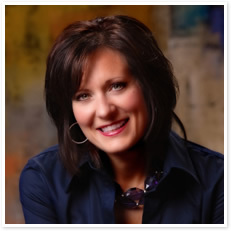 As president of Proverbs 31 Ministries, Lysa has led thousands to make their walk with God an invigorating journey. This book & DVD set were sent to me for review, courtesy of LitFuse Publicity Group! Thank you! TITLE: "Making Habits, Breaking Habits"
This is a fascinating book about habits — how they work, how to make and break them, and how to make changes stick. I loved that this book was so full of practical examples of how to make & break habits. And, this wasn’t just the same old-same old that you’d find in any other book. This one had new techniques that I’d never heard of! For example, in making habits, he talks about setting intentions … calls them “implementation intentions” … where you use an “if-then” sort of equation. If you want to start a habit of exercise, say, you can write, “If I have time on my lunch hour, then I will walk for 30 minutes outside.” This isn’t necessarily “new” to me. But, in addition to these if-then statements, you also add in “mental contrasting”. This is where you picture the positive outcome of forming the new habit… then think about all of the obstacles that are realistically in your way of creating that new habit. “The idea is to make the association stronger in the mind between the bad…habit and how this is stopping you from reaching a cherished goal.” (p.178). I’d never heard of this before, so it was exciting to learn about! I also was really –pleasantly– surprised to find a whole chapter on creativity and “creative habits”. It talks about how creativity works, and how to increase it. Overall, I really enjoyed this book. And, while -yes- there are some spots that are kind of technical, the majority of the book is very easy to understand, and doesn’t take a lot of “brain power” to read through. I liked that the author is from the UK, so there are some words & phrases that are different from the Western way of speaking/writing. And, the many, many studies mentioned throughout help to back up the principles being taught in the book. 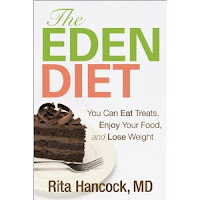 The Eden Diet by Rita Hancock, M.D. That, right there, basically sums up this book’s premise. THE EDEN DIET is a good guide for learning how to eat according to your “internal weight control system”. Dr. Rita’s approach is very freedom-focused, and she gives people ‘permission’ to eat what they truly enjoy, no matter their starting weight. There’s no guilt or condemnation here! She, herself, knows what it’s like to struggle with being overweight, as she lost 75 lbs with this way of eating, and has kept it off (if imperfectly) for over 25 years. Even though the program is a Christian one, and God is a primary focus, this book is not at all “preachy”. I think, even if you don’t have a Christian worldview, you could still read this book for its weight loss advice/plan without feeling like you’ve been beat over the head with the Christian message. The challenges presented inside — from the 7-Day Challenge, to the 30-Day Blocks, to the Apple Test — are all very helpful, but they’re not so complicated or intimidating as to scare you off. They have just enough to them to motivate you. Many topics are covered inside, including (but not limited to): whether or not to eat breakfast, how to handle buffet meals and other special occasions, food- and people-triggers, and how to still eat when your family does. I really liked how, at the end of each chapter (and even at the end of some sub-sections), Dr. Rita would give you a summary of what you’ve just read in order to help cement the ideas presented. Overall, this is a fantastic book, and a terribly sensible plan. I definitely give this book my highest recommendation (and will be back in a few months to let you know how it’s working for me!). Back in November, I was really excited to have found the book, “Lifestyle Choices…Up to You!” by Ginger Woods O’Shea, as I’d thought it was going to talk about the link between our spiritual lives and how we treat our physical bodies. And, while that book started off well, it ended up being a rant against the FDA and it was a huge disappointment to me. This book, on the other hand, is exactly what I’d been looking for! Its byline reads, “Strengthening your body to strengthen your soul“. And inside, Gary talks about the need for discipline in our eating and exercise habits, and a focus on obedience to God instead of on our appearance. I really liked that Gary kept mentioning the importance of waiting for true, physiological hunger before eating. I’m a big fan of that method myself! I also liked that he’s a runner, and so he talks about that a bit, too, and the endurance it takes. Throughout the book, we’re reminded that, in order to be “holy, useful to [God], and prepared to do any good work” (2 Timothy 2:21), we need to be physically ready in addition to being spiritually ready. In other words, we can’t be lazy and indulgent. Instead, we are to be disciplined and strong. Gary uses the examples of the prophet Jeremiah, and of the apostle Paul, stating how these men must’ve been in great physical condition in order to have withstood the stuff that life threw at them! The same goes for us. If we’re weak and lazy, we’ll be unprepared to meet the challenges of life, and we certainly won’t be able to fulfill our callings (not well, anyway). We won’t be living the abundant life that God has promised us. Overall, this is a great book, and I’d highly recommend it to anyone seeking to have a greater purpose in their efforts to get healthier. Allen Zadoff used to be 360 pounds. He would hide in his apartment, and he would sneak food. He would eat enough, at one time, to feed three people! But then he had an epiphany… and he got help. This book is a compilation of short (1-2 page) chapters, with humorous tidbits about gaining & losing weight. Mr. Zadoff doesn’t suggest a diet plan, but just shares what worked for him, in the hopes that you will have inspiration to get thin, too. He says on page 123, “The principles of this book will be extremely useful to all people struggling with any compulsion around eating.” And, yes, there’s a short bit about anorexia & bulimia in here, too. But, most of the book is about being a food addict… compulsively overeating. Definitely one that you should check out, if you struggle with food/weight. It’s light-hearted, and quick, but full of wisdom.